I remember one day in college that changed my perspective on church forever. I was standing in a Christian bookstore talking to an acquaintance when the conversation veered on to what was wrong with the Church in America. Not a hate-fest per se, just a “man, we wish things could change and grow and allow for imperfections a lot more.” The guy then started describing a church that he was starting that would be different. He went on to try and recruit me to his leadership team for this church. He talked a lot about doing things differently, but it didn’t feel right to me. As he went on, I began to realize that while he was presenting himself as an out-of-the-box thinker, that wasn’t really true. He had moved his box to an unorthodox position, but he was still very much stuck in that box. Which is not necessarily bad – true out-of-the-box thinkers can be very annoying to be around. But thinking you are one when you really aren’t? More than a little awkward. I think that has been my experience with the emerging church. They all move their boxes to new or different places, but still want to stay firmly in that box. Which, again, is not necessarily wrong – boxes give us social norms to understand and utilize in many ways. But it is awkward to watch an emerging Christian criticize a fundamentalist for their unhealthy focus on literal interpretations of certain scriptures and then turn around and get mad at you for bringing in a completely different take that is neither fundamentalist or emerging. Its kind of like the cool kid that thinks he is cool because he thought he was avante-guard and then he runs into a true avante-guard person and get flustered at being exposed for not really being that avante-guard. Wasn’t that the plot of a sitcom or two in the 80s? Anyways, for a long time now, I have known that I don’t really fit in with traditional churches or emerging churches. Probably because they are two sides of the same coin – one modern, and the other post-modern. Post-modernism replaced modernism, and then died itself a while back. 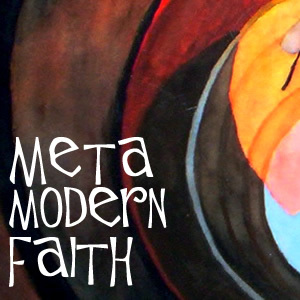 I probably was post-modern back when it was alive and well, but the growing dissatisfaction I had with the emerging church was an indication that I was distancing myself from a dying philosophy. So lately I have been trying to figure out exactly what I am. Help has come from Wikipedia of all places. But anyway, I know that for most of my life, I have had a trouble really identify as either modern or post-modern. Post-modernism has added some great ideas to Christianity. Existential Christianity has some interesting thoughts on the authority of the Bible, for instance: “An existential reading of the Bible demands that the reader recognize that he is an existing subject, studying the words that God communicates to him personally. This is in contrast to looking at a collection of ‘truths’ which are outside and unrelated to the reader. Such a reader is not obligated to follow the commandments as if an external agent is forcing them upon him, but as though they are inside him and guiding him internally…. Existentially speaking, the Bible doesn’t become an authority in a person’s life until they authorize the Bible to be their personal authority.” In other words… free will. But of course, post-modernism has that whole “no absolute truth” thing that is disturbing to me as a spiritual person and a scientist. So there is that. But you also can’t run to modernism, where everything has to be proven scientifically. Science is completely valid, but any good scientist will tell you that it is an incomplete picture of reality. Deconstruction is also another post-modern concept that I love (and often get in trouble for): “The notion of a ‘deconstructive’ approach implies an analysis that questions the already evident deconstruction of a text in terms of presuppositions, ideological underpinnings, hierarchical values, and frames of reference. A deconstructive approach further depends on the techniques of close reading without reference to cultural, ideological, moral opinions or information derived from an authority over the text such as the author.” So we have to look at an idea apart from influences to see what it really says. Good at times, but there are times where cultural influence and other issues are important to examine. But like I have stated, there are many things about post-modernism that I don’t like (and many post-modernists would probably agree with me, since they apparently argue a lot with each other and never really come to consensus on what they really are anyways). And apparently post-modernism began to die in the 1990s and finally kicked the bucket sometime in the last decade or so. So what is a recovering semi-post-modernist to do? Wow. You know what, that has been me all along. I have been torn between being drawn to the good in both modernism and post-modernism while being repulsed by the problems in both. I don’t like black and white extremism. I like grays and ambiguous spaces where many ideas interact and a lot of faith is needed because things are less certain and easy. So, I guess this is me, confessing to being a metamodernist Christian and not really knowing what all that means. Like any other philosophy, there are many disagreements on what metamodern means, and just like in post-modernism, you don’t have to follow everyone else’s definition to still be a part. If modernism and post-modernism are black and white opposites, metamodernism is the area in between that looks gray at first, but turns out to be a swirl of the best of the blacks and whites. You don’t have to give up your black or white leanings (or your personal mixture of both) to be in the mix – you just have to realize how they all have equal ground on the global stage. Ever wonder how many Church culture wars could be avoided if churches took this approach to heart? Maybe the ultra-fundamentalist complementarian right-wingers would give us egalitarians a bit of a break? Yeah, that might be a bit of a pipe-dream, but you never know.